Here is something I’ve been working on for the past few weeks. Since I just checked in the first version of this feature into ooo-build master, it’s probably a good time for me to talk about this. This feature introduces a new justification option for cell text known as the “distributed justification”, where the left and right edges of the text are aligned with the left and right edges of the bounding box by adjusting space between characters (inter-character spacing), rather than space between words (inter-word spacing), across the entire width of the bounding box. This type of distributed text justification makes little sense for Latin-based languages such as English, French and German, but makes a big difference for Asian languages such as Japanese. The reason the normal justification doesn’t work for Asian languages is because, in those languages, you don’t put spaces between individual word boundaries, and the normal justification relies on presence of spaces at word boundaries. This is where the distributed justification comes into play. This distributed justification method is commonly known as ?????? in Japanese, and is said to be one of the blockers when attempting to migrate users away from Excel to Calc. As you can see, in the normal left-aligned text, the right edges of the lines are not aligned. When the text is justified, the right edges of the lines are now aligned by adjusting the inter-character spacing, except for the last line, which remains left-aligned. When the text is distributed, even the right edge of the last line becomes aligned with the right edge of the bounding box by equally distributing the characters on that line. To allow this new justification type, I added a new justification type Distributed to the existing Cell Formatting dialog. For the vertical alignment setting, I’ve added two new options Justified and Distributed, to support justification in the vertical direction. 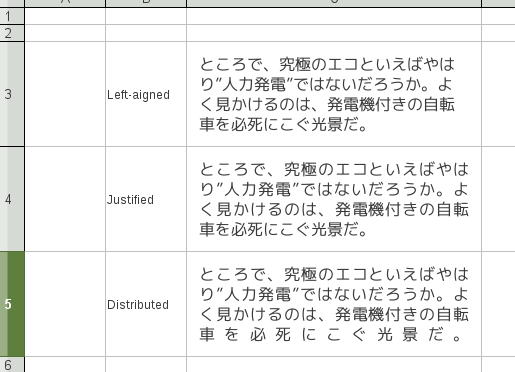 The English portion of the text is justified by inter-word justification, whereas the Japanese portion is justified by inter-character justification. The spaces between the English and Japanese text portions are also slightly adjusted in this scheme. The top cell shows text with default justification, while the bottom cell shows text with vertical justification. 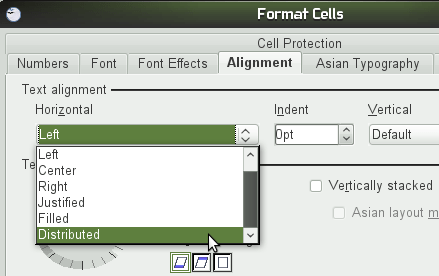 The Cell Format dialog itself provides both Justified and Distributed options for the vertical justification setting, but they do exactly the same thing for horizontally-flowing text. For vertically-flowing text, on the other hand, they do different things, but more on that in the next section. switch to Asian layout mode, which flows text in the top-to-bottom, right-to-left direction. In these modes, the Justified and Distributed vertical justification options do have different effects. The following screenshot demonstrates different vertical alignment settings in three different vertical flow modes. The code responsible for the text layout, the code where I made my modification to support this feature, is actually shared between Calc, Draw and Impress. Calc uses it to render complex cell text, while Draw and Impress use it for their text box objects. This means that, any improvement I make in this area will automatically be made available for all three applications. All that needs to be done is to simply adjust the UI in each app and add hooks in their respective import/export filters. Whether or not I’ll work on that during this cycle is another question. Having said that, I’d like to eventually get that done, and I’d like to do it sooner rather than later. But we’ll see how that goes. As of this writing, I’m not entirely done with this feature yet. I still have to cover some corner cases, and I still need to fix some bugs which I unfortunately discovered while taking screenshots for this post. So, stay tuned for further fine-tuning! I guess I don’t really have to tell the world about this, since if you type the title of this blog post in Google it will come back as the top hit. But it’s still worth mentioning msysgit, a pretty darn good git client on Windows. It’s small, it’s efficient, and it’s git. :-) You could of course use git in cygwin, but git in cygwin feels a little “heavy” and by no means small, since you have to get the whole cygwin environment to even use git. So, if you don’t already have cygwin, and want to use git on Windows, msysgit is a pretty good choice. It comes with a minimal bash shell, and while I’m happy to see ssh included with its shell, I was a little disappointed that they left out rsync. But that’s just one minor downside. For me, msysgit is my git client of choice on Windows, especially in a virtual machine setting where the disk space is tight. On a build machine, though, I still use git in cygwin since I already have to use cygwin to build OOo. Today I went to see my dentist to do my routine teeth cleaning done. In their office, I was asked to fill out a medical history form since my current form was 4 years old. On this form, you are asked to answer questions such as “have you ever had heart attack?”, “are you taking any medications?”, that sort of stuff. Nothing unusual right? However, one question caught my eye, and I can’t believe what I was asked to answer. Do you have any allergic reaction to Bananas? But the story didn’t end there. Later, she asked another dentist and asked her opinion. While they had a pretty lengthy discussion going back and forth, she too was not able to come up with a reasonable explanation for the significance of the question. Does anyone out there with enough medical knowledge know why they need to ask that question, and how is that relevant to dentistry? P.S. A quick google search has come up with this explanation.